I was in the mood for a sweet teen romance that would make my heart flutter and my insides melt. The Distance Between Us is just that kind of book. It’s not an epic love story, it doesn’t have any paranormal aspects, and it doesn’t make you analyze every word. It’s just a sweet, wonderful romance about two people coming together and figuring love out. Cayman has always been there for her mother. She helps run the doll store her mother owns, even taking time away from school to make sure her mother doesn’t work too hard. After being abandoned by her father before she was even born, her mother’s impression of the rich has worn off on her. They just don’t understand what it’s like to struggle, so she doesn’t really give them the time of day. So when Xander walks into the doll store and breaks a few of those stereotypical rich ideas, Cayman isn’t sure how to handle it. Add in Masen, the lead singer for a band and someone her mother thinks is a better match, more her equal, and you’ve got a fantastic story. I love Cayman. She says it how it is and her sarcasm and dry humor are what keep this book from being too sappy. She doesn’t take herself too seriously, but it’s easy to see that her sarcasm is a way to protect her from having to deal with the unpleasantries of the world. She has a wall up, with good reason, and her humor is how she defends that wall. It was in the moments when she let that shield down, though, that I found myself adoring her. It was easy to see how much she cares for people, even if she tries to stay aloof. This book could have easily fallen into Hallmark movie cheesiness territory, but it was Cayman that kept the novel feeling light and fresh. Xander is charming and sweet, just what he should be. Even Masen is wonderful. There wasn’t any competition between the two, but I liked how Masen was there to show that Cayman wasn’t going to settle for something she didn’t feel was right. Masen wasn’t there to provide a distraction, he was there to make sure Cayman followed her heart. And her heart led her to Xander. The fact that they started out as friends was perfect. It made the romance feel authentic. They pushed each other to be more than what they thought they could be. They created a base before building a relationship on it. Yes, there were a few trust and miscommunication issues, but in a teen romance, that’s what you expect. They work through them and in the end it creates a stronger relationship. There is a bit of a twist at the end that doesn’t really help or hurt the novel, but that’s okay. It was just there and I think even without it, the novel would have been just as good. I can see why West added the plot point though, and it does help move the story along. Kasie West has written a wonderfully sweet novel about overcoming stereotypes and finding that first love. It could have easily become too cheesy to read, but the characters keep it from straying into that territory. They’re real and funny and sweet and perfect. 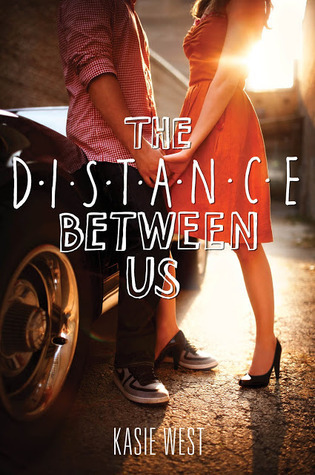 The Distance Between Us is the perfect read if you’re looking for something that will make your heart flutter. This entry was posted in Contemporary, The Must Reads, Young (and New) Adult and tagged Contemporary, Kasie West, Must-Reads, Young Adult.